TAK Technology Inc.’s mission is to provide exceptional, quality billing software for the budget minded. The company has been in continuous operation since 1983, with a growing reputation for unequaled software products and superior service and support. TAK’s Quikwater products have been installed throughout the continental United States including Hawaii, Jamaica, Costa Rica, New Zealand, Ireland and Africa. 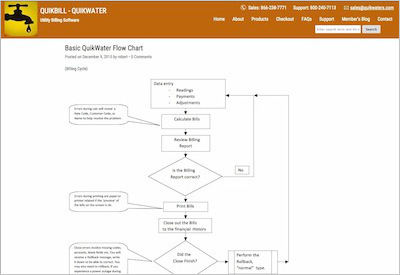 QuikWater has become the billing product of choice for many rural community water systems, cities and towns throughout the world. Our success is based on quality service, tremendous value for the money and attentiveness to the real needs of our clients. This project upgraded a legacy WordPress system with the additional features of digital downloads and a members only blog, along with a variety of improvements in appearance and an upgraded PayPal interface for product purchases.